Homeschoolers provide a playful look at Marble Falls. It’s not difficult to imagine Marble Falls — with its array of parks, lakes, camps and playgrounds — as a town-sized nature playscape. Everywhere you go, outdoor fun beckons, particularly for the young at heart. This Central Texas town of 6,500 is home to the founding members of the Texas Hill Country Homeschoolers, Jennifer Jones and Jennifer Newberry, with more than 1,000 students participating. Some of these bright, outdoor-oriented youngsters showed me all the fun in Marble Falls, through their eyes. 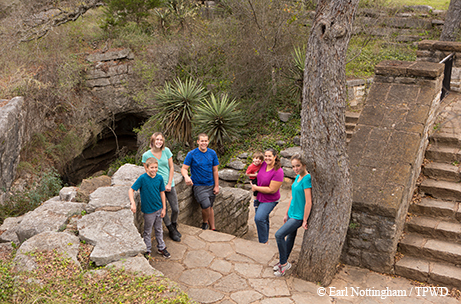 Texas Hill Country Homeschoolers at Longhorn Cavern State Park. The day was chilly and drizzly. We entered the year-round 68-degree cave, where the lights gave a warm glow and cast shadows on the undulating walls of the cave, protected from the falling rain. “Think about a pecan stuck on the wall,” says tour guide Al Gerow, helping us spot hibernating females of one of the smallest bat species in Texas. The eastern pipistrelles looked like little winged pecans as they hung in depressions just larger than their bodies to stay warm. Longhorn Cavern is a fast water cave. You won’t see many fragile stalactites or stalagmites, but, like the popular slot canyons of Arizona and Utah formed by thundering creeks and rivers, you’ll find water-cut curves and sculptures. The resulting shapes have been named, like passing cloud animals, by children since the park’s opening. The youngest boys of our group, Max and Rafino, splayed on their backs with hands resting behind their heads, staring at the oval ceiling of the old gunpowder manufacturing room where swirling marble-like layers reveal the motion of an ancient whirlpool. We passed the four-legged Queen’s Watchdog formation. In keeping with tradition, we touched the smooth Bear’s Nose for good luck as we passed, as generations of kids have done before. When the climate started to change and the sea that covered Central Texas millions of years ago started to retreat, magnesium from the sea water was deposited, accounting for some of the smoothest, strongest limestone sister rocks, called dolomite. The remarkable quality of the area’s rocks was incorrectly identified as marble when first discovered, just like the “falls” the town is named for. We passed through the Viking Prow, Eagle’s Wings and Devil’s Footstool to the Smokehouse room, named after the sausage-shaped stalactites. “Who’s on the five-dollar bill?” Gerow asks, testing the kids to see if they can name the profile of a former president etched in stone. Young hands flew up, the kids eager to name Abraham Lincoln. “Like a diamond in the sky,” Jones sang to the youngest as we entered the glittering Hall of Gems, colored by floodlights. We neared the end of the hour-and-a-half tour as the children penguin-walked and limboed during the bent-over walk through Lumbago Alley. After the tour, we drove toward Inks Lake State Park and the Perissos Vineyard and Winery, to eat at the Hoover Valley Country Store and Café. While munching on chicken tenders, loaded potatoes, chicken-fried steak and fries, we discussed everyone’s favorite outdoor spots around Marble Falls. The oldest of the bunch, Avery, 16, is a newly fledged yoga instructor who says she learns best through touch. The Hall of Gems, where she could touch the calcite crystals, was her favorite. Rafino, 10, says his all-time favorite spot is Chicken Rock at the Devil’s Waterhole in Inks Lake State Park. Marny, 13, enjoys exploring the lake’s endless coves. In fact, lakeside parks are a central meeting location for many families. Schist formation at Reveille Peak Ranch. The next stop was the Upper Highland Lakes Nature Center, just north of Inks Lake. The 5-acre outdoor learning center on the Reveille Peak Ranch property is entirely volunteer-run and accessible only by reservation. The nature center customizes day activities for families and school groups alike. Options include angler education, nature scavenger hunts, a beetle station, water conservation and garden demonstrations, as well as hands-on display tables, such as a touch station for the visually impaired. Billy Hutson, founding director and president of the center, is our guide to the area’s geology and archeology. Hutson lifts a handled door from the ground, like an entrance to a secret passageway, revealing an ancient hearth. On this high spot overlooking the water, Native Americans lived, cooking and eating around this campfire. Hutson asks if the kids know what the subtly arranged rocks are. “If I was an archeologist, I would know!” Marny responds. The students left with an archeological understanding of the land, learning that the particular assemblage of food-related articles and the depth and sequence in which artifacts are found indicate their age. We played a hypothetical game of survival. If we were here 4,500 years ago, when the Nolan projectile points found in this area were created (at the same time the pyramids were being built), would you use the Nolan point on an atlatl spear-thrower, or would you prefer to hunt with a bow and arrow? What would you hunt with each weapon? Who would last the longest? A game of sibling rivalry ensued, but would cooperation win the game? The girls role-played hunting bison, while the boys were content with squirrels and snails. Next stop, we wove through mint-colored lichen and pink granite outcrops to a waterfall, lined by black rocks resembling a lava flow. Hutson says geologists travel from out of state to see the formation —some even shed a tear at the rare find. 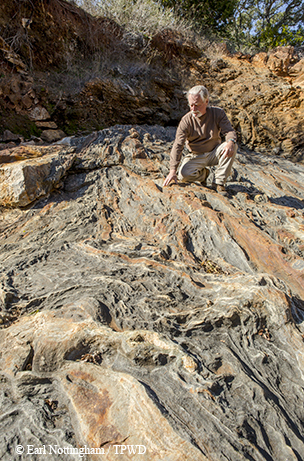 The garnet-studded Packsaddle schists are some of the oldest rocks in Texas and the world, created during a mountain-building event older than the Himalayas. The rocks around Marble Falls are unique, supporting resilient ecosystems and providing an outdoor classroom to students. By touching the oldest rocks in Texas and standing around the same campfire as someone who lived more than 4,000 years ago, we learned a lesson in deep time, a difficult concept to grasp. To reward and fuel the kids for our next destination, we treated the kids to a stop at Choccolatte’s. The husband-and-wife team of Michele and Steve Parsons make a fresh, handmade batch of gelato every week. They offered us a sample of the gelato and their popular pecan English toffee. Located in historic Old Oak Square on Third Street, the storefront has an old-town look with cast-iron café tables and French-style awnings. Many boutique shops and wineries line the street. With heads full of spirit and stomachs full of sugar, we headed to Johnson Park for some horseplay. Located adjacent to historic downtown on the shores of Lake Marble Falls, Johnson Park was platted by 1887, when the township was founded, and used for community events as early as 1888. Just last year it was designated as a Lone Star Legacy Park, the 29th park to receive the designation, and remains the center of town activities and many time-honored events. Johnson Park has hosted the annual Howdy-Roo Chili Cook-Off since 1973 and the LakeFest Drag Boat Race since 1992. We arrived at Johnson Park and the kids burst out of the sides of the SUVs, beelined to the tire swing — Max and Rafino’s favorite feature — and executed a perfect mount. They’ve obviously done this before. For the parents, it’s easy to entertain the kids when it seems as if there’s an event almost every weekend from March to November, including a monthly skate contest for all ages at the adjacent Falls Creek Skatepark. The Texas Hill Country Homeschoolers hold their science co-op and book club at Johnson Park, including a workshop on sound and magnets by Jones at the pavilion, kickball and soccer tournaments in the fields and yoga (taught by Avery) at the park’s amphitheater. After a while, the kids came running up to the picnic tables where we sat. Flushed and panting, they reached for the leftover 6-inch Choccolatte’s cookies that stretched to the corners of their wide grins. Kids come to Marble Falls from all over the state to go to popular summer camps like Camp Peniel, Camp of the Hills and Camp Champions, or to enjoy a day trip to Sweet Berry Farms to pick their own strawberries in spring or pumpkins in fall. I came thinking we’d teach them a thing or two about the outdoors, but I think I got schooled. 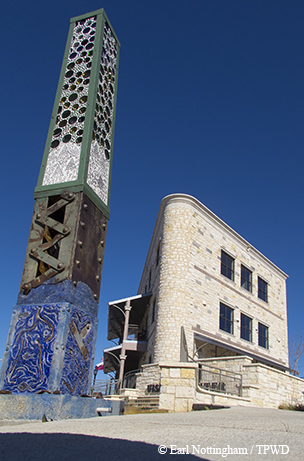 Spend a day in Marble Falls with children, and they’ll be sure to show you the best places.